Our planet’s climate appears to be reaching a potential tipping point more rapidly than previously estimated, according to preliminary results from data obtained from new remote sensing equipment on the European Space Agency’s (ESA) CryoSat-2 satellite. Arctic summer sea ice is being lost at a rate 50 percent higher than most of the scenarios projected by leading climate scientists, according to a report from The Guardian. Researchers are for the first time able to accurately measure the thickness of sea ice across the Arctic’s expanse thanks to new instruments aboard ESA’s CryoSat-2. Preliminary results indicate that 900 cubic kilometers of summer sea ice has been lost during the past year. Whereas Arctic summer sea ice thickness averaged between five to six meters a decade ago, it’s now just 1-3 meters thick. The complete, or near total, loss of Arctic summer sea ice for all or part of the year would have profound effects on climate and life both locally and globally. Energy, mineral resource and commerical fishing companies view the opening of the Arctic seas as a new frontier for natural resource extraction. It would also be a boon for shipping companies and maritime transport, as it would open up the Northwest Passage and other shorter, less costly routes between North America and Eurasia. The effects on local and global climate and the environment are likely to pose serious challenges for human, other animal and plant populations, however. The loss and thinning of Artic ice coverage accelerates climate warming as there’s less white ice surface area to reflect sunlight and heat up into and beyond the earth’s atmosphere, which will result in an acceleration of ocean temperature increases. That may cause submarine methane deposits to melt, evaporate and escape into the atmosphere, adding significantly to the greenhouse effect. The appearance of methane plumes has been reported in many areas, The Guardian’s Robin McKie notes. The disappearnce of Arctic sea ice around the Greenland coast would likewise have potentially devastating effects. Coastal sea ice around Greenland helps keep terrestrial glaciers there bottled up. Their disappearance would open a clear path to the sea, accelerating their melting. That would lead to sea level rising faster than it has been. Disappearing Arctic sea ice could also result in profound changes to weather patterns globally, including precipitation levels and timing. ESA’s CryoSat-2 is the first satellite built specifically to measure and analyze sea ice thickness. It was launched on April 8, 2010 on a Dneiper rocket from Baikonur cosmodrome in Kazakhstan. 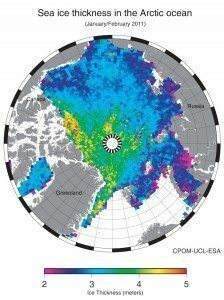 Painstakingly analyzing the accuracy of CryoSat-2’s measurements, ESA project scientists are confident that CryoSat’s maps of ice thickness are correct to within 10 cm. Varying throughout the year, Arctic sea ice cover has typically reached a maximum in March. The data received from CryoSat-2 enables researchers to clearly reveal the extent of Arctic sea ice loss over the past eight years, both in winter and summer. In Summer 2004, Arctic sea ice thickness totaled about 13,000 cubic kilometers. That’s been reduced to 7,000 cubic kilometers this summer. Arctic summer sea ice cover would disappear in about a decade if the current average annual loss of some 900 cubic kilometers continues. UCL’s Laxon emphasized the need for prudence when making predictions and jumping to conclusionos based on CryoSat-2 data given the complexity of the earth’s climate system. He noted that Arctic sea ice loss in winter was much slower, which partially compensates for the loss of summer sea ice. Nonetheless, the trend in Arctic sea ice coverage is undeniably downward, and likely on a steeper slope than has been estimated. A study undertaken this year by EAS Cryo-Sat project team Professor Peter Wadham indicated that the volume of Artic summer sea ice has dropped 70% during the past 30 years.